When construction of the Madeira-Mamoré Railroad began in 1867, Bolivia had lost its war with Chile, causing it to become landlocked and unable to ship its minerals and other products from the Pacific Coast. Since Bolivia needed to find a way to move products from the Atlantic Coast, the government decided a railroad should be built around the Madeira River—which originates in Bolivia and travels almost 2,000 miles through Brazil to the Amazon—facilitating shipment to foreign markets via the Amazonian waterway. Completion of the railroad was initially stalled by lack of funding, but the project was resurrected in the early twentieth century and completed in 1912. Intended as an integral piece of the rubber export industry, the railroad became unnecessary once the world supply of rubber moved from Brazil to Asia. Although there have been many brief chronicles and writings about the Madeira-Mamoré Railroad over the years, most barely scratch the surface of this incredible story. 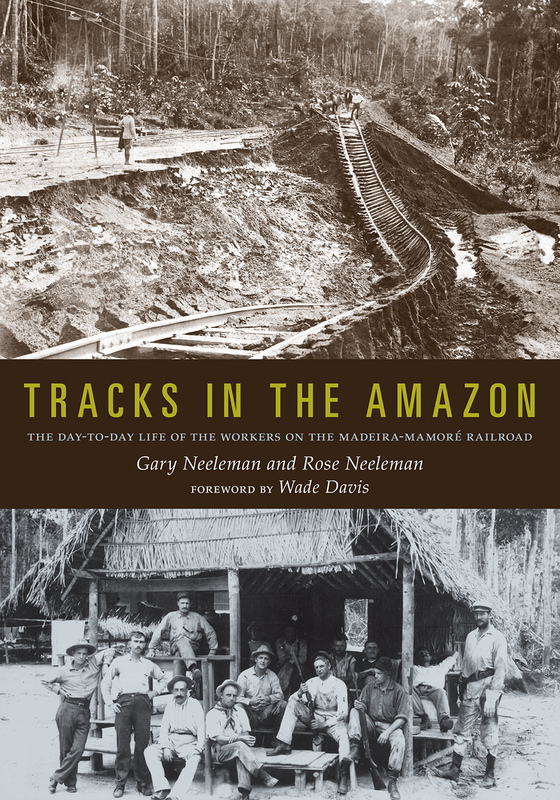 Of particular import in Tracks in the Amazon are the photographs—which until now have rarely been seen—taken by Dana Merrill, a New York photographer hired to document the construction of the railroad. It also includes reproductions of the Porto Velho Marconigram, an English-language newspaper written for and by the American expatriates who lived in the construction headquarters at Porto Velho. Because this unique railroad traversed the densest tropical jungle on earth, more than 10,000 workers lost their lives laying the first five miles of track. The images and descriptions of the life of the workers on the railroad illustrate the challenges of working in the jungles—the unforgiving climate, malaria and yellow feverbearing mosquitoes, and the threat of wild animals—which made conditions for the workers next to impossible. Finalist for the International Latino Book Awards: Best Book in Nonfiction in Portuguese. Gary Neeleman and Rose Neeleman lived in Brazil for more than ten years, where Gary worked as a foreign correspondent for United Press International (UPI) and later was the vice president of UPI for the Latin American area. He is currently the Honorary Brazilian Consul for the state of Utah. Both authors are fluent in Spanish and Portuguese.